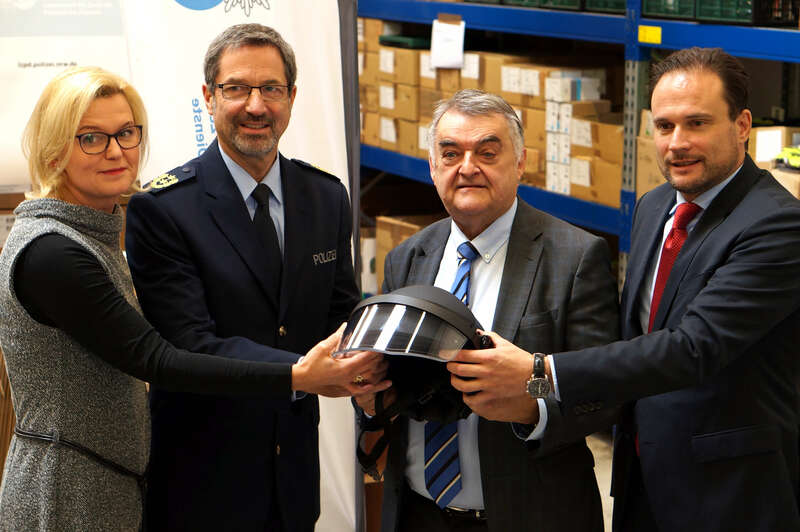 Georg Scharpenack, Owner and CEO of ULBRICHTS Protection, handed over the first ballistic titanium helmets to the NRW police today, together with NRW’s Minister of the Interior Herbert Reul. Schwanenstadt (Austria) / Cologne – ULBRICHTS Protection is supplying the police in the German state of North Rhine-Westphalia (NRW) with ballistic titanium helmets. The state government in NRW’s capital Dusseldorf wanted to ensure that the emergency services enjoyed the highest level of security and made a choice for the helmet which offers the maximum ballistic protection on the market. Today sees the first examples of high-tech head protection handed over in Cologne. The headgear is also equipped with a splinter protection visor. The equipment now gives patrol officers the highest and most effective level of head protection currently available. With a total weight of around 3.3 kilograms – including the shield, visor and adapter – the helmet is fully operational. Ballistic helmets for police officers provide effective protection against bullet fire if they stop the projectile reliably and at the same time prevent a fatal trauma to the helmet wearer. Such a trauma can be caused by the energy transmitted by the impact of the bullet. Experts have defined a residual energy value of 25 joules and set down this value in guidelines (e.g. VPAM HVN 2009). This value must not be exceeded, otherwise irreversible or fatal head injuries can occur. The HOPLIT F 1100 H titanium-aramid helmet (VPAM 4+), in combination with the VPAM-6 FORTIS face shield, is capable of reducing the projectile energy of a bullet fired from a Kalashnikov (7.62 x 39 iron core) of more than 2,000 joules at a speed of around 720 metres per second to well below 25 joules. A frontal head shot is thus survivable.